After playing around with ideas for seating in my Sukkah, I began to wonder, what if I just expanded it? The problem is that it's made of canvas, which is wrapped around a metal frame. This does not seem like it would be expandable. But then I began to think about the possibility of pulling back one of the "walls" (ie., just not wrapping it around, and instead extending it out). Below are some rough sketches of my current canvas Sukkah and my first rough idea of a way to expand it and open it up. The idea is that I would just not wrap the canvas all the way around, and instead I'd extend it outward and set up posts to support the Sechach. Some of the posts are needed for the structural integrity of the Sukkah frame itself, and so they won't be taken down, and I'd add new posts in a couple of spots to support additional "roof" beams with bamboo laid across the top of them. So the theoretical side of my question is, how far can I extend the 3rd wall (the wall that's roughly 7 feet long) without a physical wall there? It would have a Tzurath HaPethaḥ, if that makes a difference, all the way across, because I would still need beams to support the Sechach, and those posts are there to support the beams. So, every place you see a gap, there would still be a beam over the top of that gap. On the practical side of my question, one issue of possible concern with my new design is that the tightly wrapped canvas might act like a sail and topple the Sukkah in a gust of wind. The frame is heavy and very sturdy, and the canvas itself is also heavy, but I wonder if it might still be a problem. Another issue related to wind exposure is whether items on the table might be blown to the ground. And, as I said, this is a first rough idea of one way to expand it, so if you have other suggestions that would work better, from either the standpoint of Halachah or practicality, I'm open to ideas, especially from those with real-world experience! I've seen someone extend his canvas Sukka by purchasing additional poles and canvas. 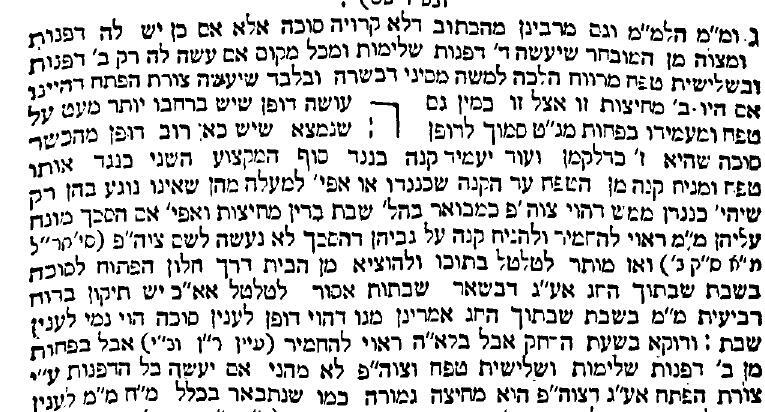 While four walls are ideal, if you have two walls that form a corner, and the third wall has at least a tefach (~4 inches) of width and forms a tzuras hapesach, that works. Not the answer you're looking for? Browse other questions tagged halacha sukkot sukkah architecture-design .